Move over Google. It’s time to try this instead: Discus. 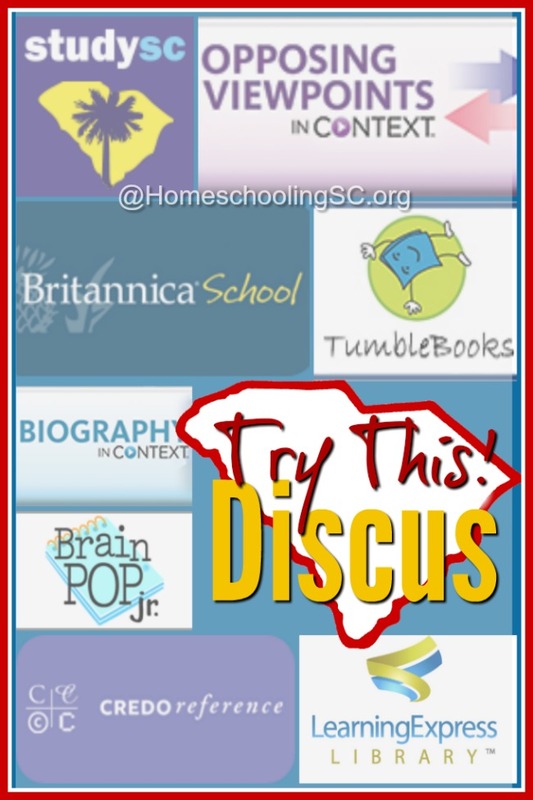 The Discus resource is one of my favorite homeschool tools. And it’s FREE for all residents in South Carolina! It’s like some kind of secret that nobody seems to know about. But, I’ll shout it from the rooftops–you’ve got to know Discus! But, it’s so cool once you dig into it. Please just try it–I think you’ll like it. If you’d like test prep for GED, SAT, ACT plus full practice tests. If you’d like to find out pros and cons of hot-button political and social issues–from vetted, researched perspectives (not just the echo chamber of social media). If your emergent reader would benefit from audio read along options. 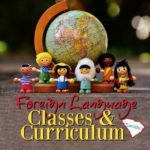 Or you’d like to try familiar books and topics in a foreign language. If you’d like your students to learn how to learn. This information is accessible from your home…all this is right at your fingertips! 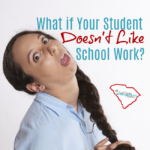 What a great thing for South Carolina homeschoolers to be able to utilize. You’ve got to know Discus! Discus is free to all South Carolina Residents. You can access it though your county library website with your library card. Or through the State Library with a secret User ID and password (which we’re not allowed to publish online.) Note: if you need the access info, we have to verify you’re a resident of SC and then we can tell you privately. Contact me if you’d like the access info for Discus. 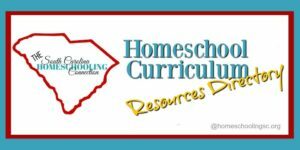 See what all the Discus resource has to enhance your homeschool. It’s great for unschoolers to follow their interests on any topic. It’s also an ideal supplement for any curriculum. 20th Century Historical Videos: Historical primary source video clips for middle school and up (though many clips would also be appropriate for Elementary). Notable topics include the industrial age, the Great Depression, the women’s rights movement, the Holocaust, world leaders, the Kennedy years, the civil rights movement, technology and innovation, the space program, the Cold War, apartheid, pop culture, and more. Animal Kingdom: Easy-to-read articles, videos, and photos with age-appropriate reference and learning materials for ages K-4th grade. Biography in Context: A comprehensive resource of more than 600,000 biographies of people from around the world and throughout history. For all ages. Multimedia content that includes video, audio clips and images. Bloom’s Literature: A comprehensive source for literary research on writers and their works throughout history and the world. Information on more than 46,000 major and minor literary characters. For middle school and up. Britannica School: An encyclopedia and related content on three levels: elementary, middle and high school, as well as teacher resources; also includes access to the Britannica Learning Zone for early-childhood learners in prekindergarten through 2nd grade. Read-Aloud feature in the encyclopedia articles highlights each word as it is read to increase comprehension for struggling readers, English language learners, and visually impaired users. Credo Reference: Where do you even start to research a topic? Credo’s database includes overview and orientation on topics and subject matter. Mindmapping tool helps locate subtopics that you should include in your lessons or research paper. Includes links to encyclopedias, biographies, chronologies, and dictionaries, all from well-respected publishers. Plus the entire DK Eyewitness eBook series is available here too. Culture Grams: Delve into the map and take a closer look at the history, lifestyle and society that lives there. Audio and video clips, recipes and teaching activities. Explora for Elementary Schools: Search this collection of more than 1.2 million images of relevant photos, maps, flags, and more. 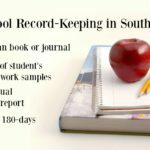 Includes nearly 100 popular full-text elementary school magazines, such as Boys’ Life, Cricket, Highlights, Junior Scholastic, and Zoobooks. Kids Infobits: A kid-friendly articles, pictures and reference information on all subjects. Includes activities, recipes, experiments, poetry and stories by children. For ages K-5th grade. Teacher Toolbox to help teach research and writing skills. Learning Express: Test prep resources for all ages. A comprehensive collection of test-preparation tools, skill-building materials, and other career and life skills resources. Tools for improving proficiency levels in reading, writing, and math for elementary school learners through adults. Interactive skill-building tutorials and 130+ e-book titles. You can even take a simulation SAT test for practice…set it at timed or untimed. Literary Reference Center: A broad spectrum of information on thousands of authors and their works. Includes plot summaries, synopses and work overviews; articles/essays of literary criticism; author biographies; book reviews; classic and contemporary poems and short stories; and author interviews. Opposing Viewpoints: Explore 100’s of contemporary social issues with content structured to promote critical-thinking skills and information literacy. Vetted, peer-reviewed articles, pro and con viewpoints for middle school and high school research. 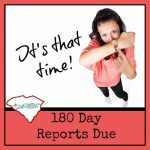 StudySC: Welcome to South Carolina with links to quality online content for South Carolina-related topics for all ages. Tumblebooks: Contains over 1,400 read-aloud storybooks, chapter books, graphic novels, songs, and National Geographic videos. Geared for ages K-6th grade. Special features include a book report organizer, puzzles and games, pre-selected playlists. Some books are available in Chinese, French, German, and Spanish. Plus Discus has several college and adult reference databases to explore business, alternative/natural medicine, and auto repair. It’s a lot of information to explore. So, just start with one of the links. Download the pdf file for directions for exploring that one tool. Some of them have scavenger hunts to help you get familiar with navigating the database. The State Library offers online training webinars to help you get Discus orientation. Check out their upcoming live workshops and their archived workshops too.